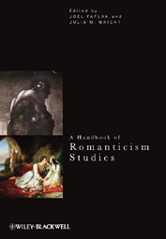 Editor/Author Faflak, Joel and Wright, Julia M.
The Handbook to Romanticism Studies is an accessible and indispensable resource providing students and scholars with a rich array of historical and up-to-date critical and theoretical contexts for the study of Romanticism. Focuses on British Romanticism while also addressing continental and transatlantic Romanticism and earlier periods. Utilizes keywords such as imagination, sublime, poetics, philosophy, race, historiography, and visual culture as points of access to the study of Romanticism and the theoretical concerns and the culture of the period. Explores topics central to Romanticism studies and the critical trends of the last thirty years.